This month’s Music in the Lobby concert highlights bass-register instruments (cellos, double basses, bass clarinet). Join us – It’s All About the Bass! Fenwick Lobby, Wednesday, October 24, 12:30 – 1:30 p.m. Free! Plus – exciting news – Music in the Lobby concerts are now approved by the School of Music for MUSI 300 credit! Score – so to speak! 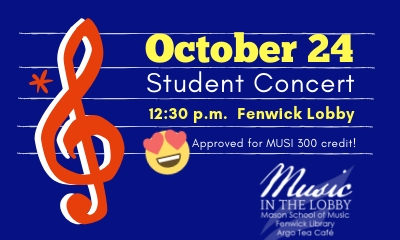 Hosted by Fenwick Library, Music in the Lobby features Mason student performances. Music in the Lobby is coordinated by Professor June Huang, School of Music, and Steve Gerber, Music Librarian. Refreshments provided by Argo Tea Cafe. Music in the Lobby: Today! Our final “Music in the Lobby” program for the spring semester will take place today, Wednesday, April 25 at 12:30pm. Come support our Mason student musicians and enjoy string music, a soprano aria, and clarinet quartet numbers. Refreshments provided by Argo Tea. Music in the Lobby returns in April with a Spring Mix of classical, jazz and vocal music – provided by the students in the Mason School of Music Strings Department. 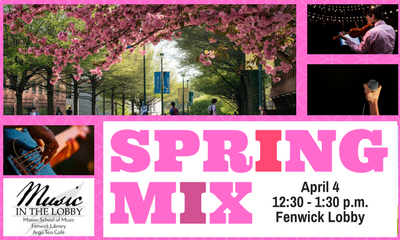 Join us in Fenwick Lobby, April 4, 12:30 – 1:30 p.m.! You could win a Fenwick Library study room to use during Spring Finals. Free refreshments courtesy of Argo Tea Cafe.